Can we turn a bland and boring staple like shepherd's pie into something a little more fun? Damn right we can - with this spicy southwest version it will impress even those meat and potato lovers. Add the sweet potatoes to a large pot of cold salted water and bring it to a boil. Boil for 20 minutes, until fork tender. Drain and set aside to cool until safe to handle. When ready, discard skins. Return to the pot, add the butter, and mash with a potato masher or hand mixer. Season with salt and pepper to taste. In a large, oven safe skillet, toast the paprika, cumin, and cayenne for one minute. Add the chorizo and brown, breaking into small bits, about 7 to 10 minutes. Add the white wine, onion, and pepper. Simmer another 5 minutes until liquid is reduced and almost gone. Stir in the corn and cook until heated through. 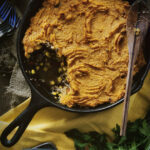 Spread the mashed sweet potatoes over the top of the skillet and place in the oven to bake for 10 to 15 minutes. Switch the oven to broil and toast the top of the sweet potatoes, 3 to 5 minutes longer.